Wisconsin high school freshman Kaiden Johnson loves to dance. So when he was told that he couldn’t participate in a competition with his school’s dance team because he was a boy, he was heartbroken. Title IX became law in 1972, and it ostensibly forbids discrimination against students on the basis of their gender. But try telling that to students like Kaiden and his parents, for whom Title IX offers no relief. At the time of its passage, there was little doubt that the nation’s colleges and universities failed to afford equality of opportunity to young women. Back then, only 42% percent of the students enrolled in American colleges were female. Forty-five years later, the reality is quite different. Gender ratios for college enrollment have flipped 180 degrees, with males comprising the 42% minority. That’s not the only major change in the last 45 years. Women now earn the majority of post secondary degrees at every level. According to the U.S. Department of Education’s National Center for Education Statistics (NCES), 52% of PhD degrees, 57% of Masters Degrees, 57% of Bachelors Degrees, and 61% of Associates Degrees are awarded to women. Now that the numbers are trending so unfavorably for males, why isn’t Title IX being deployed to correct the educational disparity facing young men? Because legal and political interest groups, along with the media, purposely focus attention on the few remaining areas in education where males remain in the majority, like athletics. 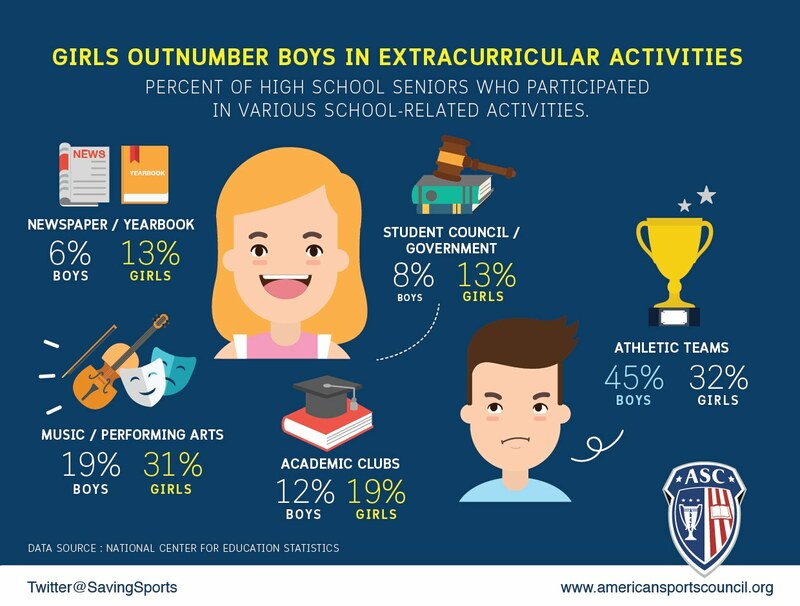 In America’s high schools, girls outnumber boys in almost all extracurricular activities, except in sports. Currently, there are over 1 million more boys playing scholastic sports than girls. Thanks to terrible legal precedents set by politically motivated judges, schools must rely on a regulatory standard that is a gender quota to prove Title IX compliance, if they want to prevail against expensive litigation. The result of this twisted interpretation of Title IX is that high school administrators will be forced to deny many male students the educational benefits of participation in sports in order to enforce an arbitrary gender balance in their athletic programs. Some feel this unequal treatment is just fine, in order to make up for past discrimination against females. Because of the intense focus on science, technology, engineering, and math, or S.T.E.M. subjects, there is a widely held perception that boys are outperforming girls in so many ways. But, in actuality, boys are underperforming girls in almost every academic measure. According to NCES records that track 9th grade students, girls go on to graduate in 4 years at a rate of 84% compared to 77% for boys. For every 100 girls diagnosed with emotional disturbance 324 boys are diagnosed with emotional disturbance. For every 100 girls expelled from public elementary and secondary schools 297 boys are expelled. For every 100 girls ages 15 to 17 in correctional facilities there are 837 boys behind bars. Extracurricular activities are a proven, positive way to keep students engaged in school, helping to improve their chances of graduating. But because of the way Title IX is now regulated, some of those opportunities are being denied to boys like Kaiden. More girls play sports now than they did in 1972, and that is a very good thing. But why are we turning away boys who want to participate? Title IX enforcement should focus solely on things that really matter to student athletes, like equal access to facilities, equivalent coaching, and funding for equipment and uniforms. At the American Sports Council we know from working with school sports programs across the country that female athletes don’t want to see their male counterparts cut from teams just to comply with a gender quota. In order modernize the Title IX enforcement system, it will take brave individuals across the country to take a stand and demand justice. The world has changed a lot since 1972, and Title IX regulations should change as well, so boys like Kaiden Johnson receive equal protection of the law. Eric Pearson is Chairman of the American Sports Council. No Replies to "45 Years After Title IX, America’s Boys Need Equal Protection"